communication knowledge, and marketable skill. First, our students hone their craft as professional communicators and storytellers, with an emphasis on practical performance in a variety of settings. Additionally, they critically examine personal narratives, folktales, organizational stories, and pop culture narratives. Second, our students examine how communication and story shape social meaning as well as foster social transformation, how they can be used to facilitate stronger connections within and across populations, and how we might draw richly from and give generously back to the communities we study. Third, our students develop workplace-ready skills to build careers as professionals and practitioners in a variety of fields, businesses, and nonprofits. Our graduates are well-positioned in the workforce as more organizations use storytelling and narrative internally as a way to recruit, train, and strengthen corporate identity, and externally as a tool for branding, facilitating client experience, and educating communities. We offer a two-year program with option for longer spans for part-time students. Students have opportunities to learn from practicing professionals and have the option to create a capstone project, write comprehensive exams, or write a thesis. Our faculty bring diverse talents, experiences, and credentials to our teaching environments to bridge theoretical and applied knowledge. As mentors, we work individually with every student to craft a program of study that helps each one meet their personal, professional, and intellectual goals. Please take a look at the "Course Requirements" tab below. Prior to submitting any application materials, all prospective applicants are strongly encouraged to talk with the graduate coordinator and department chair, Dr. Amber Kinser at (423) 439-7577, kinsera@etsu.edu. At least a 3.0 overall undergraduate grade point average. Graduate Record Examination (GRE) test scores predictive of success in the program. Three letters that recommend admission to graduate study and that sufficiently evidence the applicant's potential for success in the Communication & Storytelling Studies program. When selecting persons to write recommendation letters, please choose people who can address your academic/intellectual abilities. Optimally, applicants should supply at least two letters from former or current professors. Letters from professionals should address the applicant's applicable academic skills (e.g., research and writing abilities), potential for intellectual growth, ability to work on multiple projects, under pressure, and autonomously, and overall work ethic. The strength of an application essay that discusses both interest and fit. The graduate school requires150-300 words; the Master’s Program in Communication & Storytelling Studies faculty strongly encourage applicants to write in the high end of that range. The essay should explain why the applicant is interested in our particular graduate program. Additionally, the essay should discuss why the applicant is a good fit for our program, the courses we require, and the research or creative activity of our faculty. If there are weaknesses in the applicant’s materials (e.g., low grades or GRE score), these should be addressed in the essay as well. Choose any courses in the program not used to meet another requirement. You may take up to 9 elective hours outside the department. 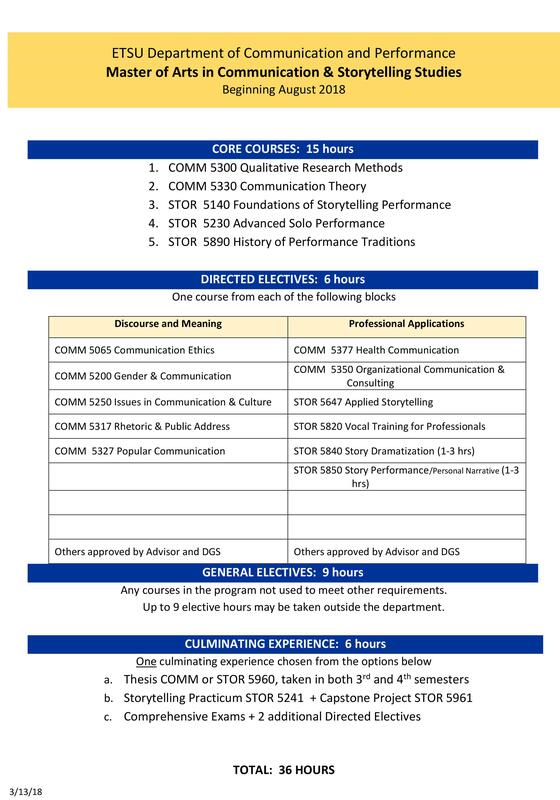 For information about the Communication & Storytelling Studies graduate program, please contact the graduate coordinator and department chair, Dr. Amber Kinser at (423) 439-7577, kinsera@etsu.edu. The department strongly recommends contacting Dr. Kinser prior to writing or submitting your application. For students interested in a shorter program (21 credit hours), see the Graduate Certificate in Storytelling in the course catalog. A tuition scholarship is a merit-based award available to graduate students admitted to the program for the first time. TS funding pays tuition in exchange for 8 hours of work per week. New students may be awarded a TS within the Department of Communication & Performance. Students who do not receive funding from our department can look for other available TS positions through the School of Graduate Studies’ Available GA/TS Positions page. 1. TEACHING: assisting a faculty member in teaching specific courses, generally COMM 2025: Fundamentals of Communication, and other duties as assigned. 2. RESEARCH: assisting a faculty member with their research program, and other duties as assigned. 3. SPEECH & DEBATE TEAM: assisting the director and assistant director in running the team, coaching team members, recruiting for the team, hosting and judging tournaments, and other duties as assigned. 4. STORYTELLING: assisting the program coordinator service work or research assignments for the Storytelling Program. Service responsibilities include organizing, publicizing, and executing the community Story Slams; booking school and community storytelling gigs for our student TaleTellers group; serving as President of TaleTellers, maintaining strong relations with the International Storytelling Center in nearby Jonesborough, publicizing for programs and concerts we host, ensuring that the program webpage is current, and completing general office duties and other duties as assigned. 5. OTHER GA POSITIONS: Students who do not receive GA funding from our department can look for other available GA positions on the School of Graduate Studies’ Available GA/TS Positions page. First-time graduate students outside the state Tennessee (including international students) who are pursuing storytelling and who are awarded neither a Graduate Assistantship nor Tuition Scholarship from ETSU, may be eligible for a Creative Arts Scholarship. This scholarship reduces your tuition dramatically, so that you would only pay in-state tuition. If you are awarded a GA or a TS, your tuition would be waived so the Creative Arts Scholarship would not apply. Graduate Coordinator, Communication & Storytelling Studies M.A. 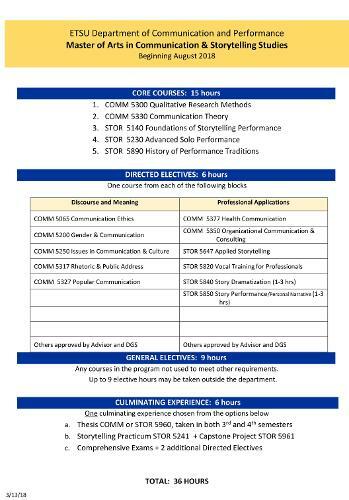 Master’s in Communication & Storytelling Studies, Course Requirements for the Master’s in Communication & Storytelling Studies (pdf). For information about the Master’s in Communication & Storytelling Studies, please contact the graduate coordinator and department chair, Dr. Amber Kinser at (423) 439-7577, kinsera@etsu.edu.